Little racers can use their imaginations to bring to life the action-packed world of racing with the Spin 'N Crash Raceway. Boys are in the driver's seat as they control all the thrills and spills around the figure-eight track. Turn the on/off ignition key, use the easy-grip shifter that changes speeds from "fast" to "faster" speeds, and press the "crash" button on the shifter box to activate realistic racing and crashing sounds. Pull over in the pit stop area overlooking the grandstands for a "quick fix" -- just use the elevating car lift and touch the mechanic's wrench for fun fix-it sounds. An easy-off ramp in the front adds to the fun and extends race-car outside the track. 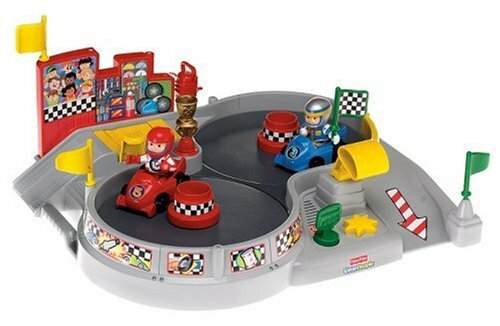 Raceway includes two colorful racing vehicles and two articulated Little People driver figures dressed in colors to match their team's car. Figures bend and twist to fit perfectly inside their vehicles. Playset also includes a racing gate anchored with cones, four flags in team colors and a sign. All play pieces fit in figures' hands and in other areas around the playset. Vehicles store securely behind grandstand for take-along fun. Requires four "C" batteries, not included.